An introduction, while the G2 image downloads. During the past fifteen years, through the efforts of his own research and experimentation, Ron Overs has developed several innovative ideas particularly suited to improving the performance and tuning stability of the small grand piano. The Yamaha G2 grand piano was rebuilt recently to verify a number of the ideas destined for inclusion in his small grand. Since the Yamaha G2 is almost identical in size to the Overs 170 design, it has proved to be an ideal piano with which to test his design. An overhead image of the rebuilt G2 is shown below. The custom 5'7" Yamaha G2 was built as a prototype for the coming OVERS model 'small' grand piano. The small radius hardened front duplex bars have been detuned. This is a departure from Yamaha's (and Steinway's) standard practice where the front duplex lengths are built to a length which divides evenly into that of the speaking length. This modification significantly reduces the string noise typical in the treble sections of many pianos. - detuned front duplexs, new to Overs Pianos following recent experiments. The string approach angle to the capo bar is adjusted to just under 15 degrees (this is achieved by lowering the height of the front duplex bars). This is necessary to prevent the small radius hardened duplex and capo bars from cutting the piano wire. 'Standard' pianos have string approach angles typically greater than 15 degrees with softer wider bars, and while the piano wire can survive with these settings, the tone quality will be inferior. The soundboard, immediately adjacent to the lowest note on the bass bridge (A1), has been cut free from its contact with the inner rim. Known in the industry as a soundboard float. This is a useful device for smaller pianos to improve the tone quality of the lower bass. This technology is being used for the first time in an Overs rebuild/new piano. It has proved to be very satisfactory. This G2 has a full bass tone which rivals much longer grand pianos. - new to Overs Pianos. - employed previously in Fandrich and Rippen upright pianos. A revised string scale has been designed for the bass section of this piano, with the original speaking lengths retained. The sound board float, together with the revised bass string scale combine to produce the remarkably improved bass tone in this piano. A tenor bridge was designed and installed to improve the tone and tuning stability across the bass/treble break. Bichord covered strings were substituted for the original plain wire trichord unisons, for those speaking lengths now connected to the sound board via the new tenor bridge. This is a proven modification which has been used in many previous rebuilds. In this installation, the agraffes were retained in their original position, while the hammer line was adjusted for the five bichord notes on the tenor bridge with reduced speaking lengths, to maintain the strike point at the correct ratio (While there are six notes connected to the 'board via the tenor bridge the lowest, B27, was retained at its original speaking length. Therefore, it was not necessary to move the B27 hammer to correct for the strike ratio). It will be noted that a typical tenor bridge redesign provides for a reduction in speaking length of between 12-14%, between the last plain wire speaking length (which is now F33 for this piano - was originally B27) and the first bichord pair on the tenor bridge. The common design practice of employing bichords on the same bridge as the plain wire is far less than ideal - resulting in tunability and tuning stability problems which cannot be solved through voicing or other such 'fudging' techniques. Furthermore, where designers persist with the 'hockey stick end' treble bridge, using plain wire right up to the crossover between the treble and bass bridges, this results in severe tunability and tuning stability problems. These very poor design scenarios are altogether too common in contemporary instruments, including several models from high class manufacturers. It is advisable for string scales to be designed in such a way that the speaking lengths continue to increase in a uniform manner up to the crossover point between bass and treble bridges (here endeth this particular gripe). The scale design of the Overs 170 is completely new. It does not require the use of a tenor bridge to achieve a 'balance' across the crossover. Furthermore, the new 170 Overs scale will (for the small grand piano) break new ground in reducing the deviation of the percentage of breaking strain across the compass of the instrument (more information will be made available when the first 170 is completed). 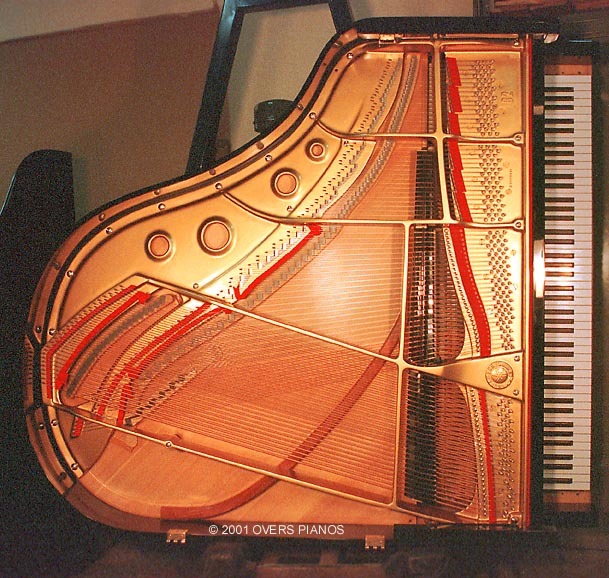 However, the deployment of a tenor bridge for existing instruments with a poorly designed crossover remains a very effective workaround for some problem pianos (which includes most contemporary small and medium sized upright and grand pianos). - standard practice since 1992, a prior art technology but a good one. The sound board has been reduced in effective area, and altered in shape, through the inclusion of a curved sound board cut-off bar. The cut-off improves sound board responsiveness and tone production by making the effective sound board on either side of the long bridge more equal in area, and decoupling the (useless) sound board area in the bass corner. The sound board ribs which run under the new sound board cutoff bar were modified by extending the rib paring out to beyond the cutoff bar. This was necessary since the revised perimeter of the sound board, where it connects at the cut-off bar, should be flexible at its edge. This is consistent with standard belly making practice, where a sound board cutoff bar is installed. With reference to the G2 image, you will notice that the active sound board area is now shaped more in the form of a curved-tear-drop, widest at the bass section at the back of the piano, reducing in width gradually to its narrowest point in the extreme treble. - first installation by Overs Pianos, a prior art technology which should be used more widely. Copyright © 2001, Overs Pianos.